That chance has arrived with Patrick, the duo’s Gothic-flavored remake of the 1978 Australian genre favorite about a seemingly comatose patient at a remote psychiatric hospital who wreaks telepathic havoc on his caretakers, including a new nurse played by You’re Next heroine Sharni Vinson. Richards talked to Deep Fried Movies about his willingness to embrace shadows, the influence of De Palma and his collaboration with long-time friend Hartley, with whom he’s currently working on a documentary about Cannon Films. You can check out Patrick now on all major VOD providers ahead of its June stateside DVD release. 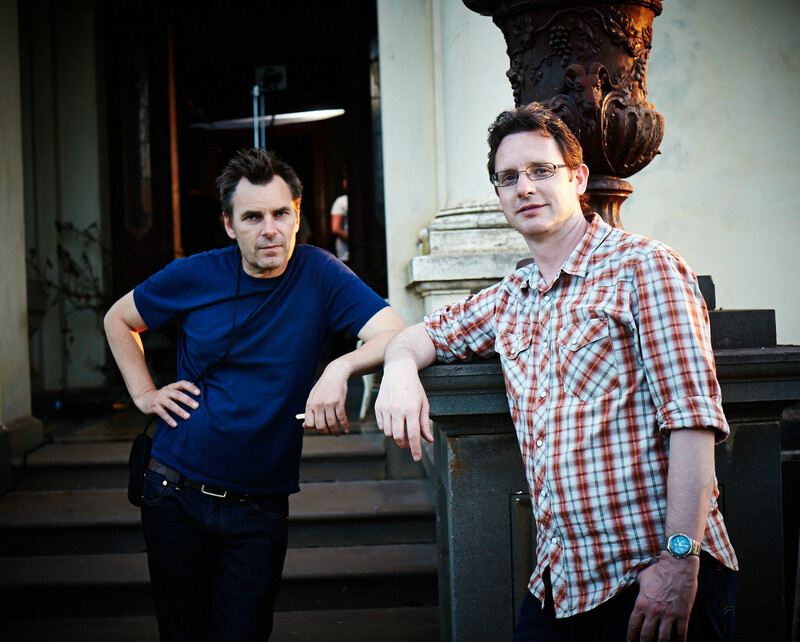 Cinematographer Garry Richards (left) and director Mark Hartley (right) on the set of Patrick. I guess my interest in photography really started, unusually, when I was in primary school. For some reason, the primary school I went to had a photographic dark room and when I was in about Grade 4 we did a photography course where we got to make our own pinhole cameras, develop our own photos and then moved on to doing a little bit of Super 8. To me, that was just an absolute eye-opener and I was completely transfixed with the process of being able to take pictures and process them yourself. Even at that young age it was very exciting and it started what was, for me, a real lifetime love affair with photography in general. Like most kids, going to the cinema when you are young was an incredible, incredible experience. It was just like basically entering a fantasy world. But unfortunately where I lived (in Australia) was in quite an isolated area. I didn’t have a lot of contact with cinemas so a lot of my early movie watching was on television, which is where Mark and I had a very similar story. We both sort of developed a love of Australian cinema by watching a lot of Australian films late at night on television when we got the chance. Whenever I could I would always try to get to a cinema to see a film, but it was very much the exception rather than the rule in my childhood years. (Above) Vinson’s nurse and Patrick (played by Jackson Gallagher). (Below) The same characters in Richard Franklin’s original film, which just received the deluxe Blu-Ray treatment from Severin. Once I got to university I was studying cinema and literature and filmmaking and really for me that was where it all started to happen. I would just be trying to shoot as many films for other people as I possibly could and just constantly taking gear out on weekends and getting to know the gear. Whilst I was still at university I was lucky enough to get a job shooting a satirical political television program that ran on the public station, the government station, here and was shot on 16mm film. I got to do that for about 12 months part time while I was still studying. It was there that I made a lot of contacts with other people who were of a similar age with similar interests and we just started doing stuff whenever we could. MTV had just started up in Australia and it was incredibly desperate for content. So we would go out and make promos for MTV, paying for it ourselves, and then from there we just all started making music videos. We would shoot music videos for record companies who were desperate for product and would put (them) on MTV. Over the course of my career I probably shot about 250 music videos. After that I started getting work shooting TV commercials. The bottom had sort of dropped out of the music video industry a bit and TV commercials seemed like a good way to keep making some money and keep doing what I really loved, which was cinematography. It was through doing music videos that I met Mark. Basically I shot every music video that he did for probably the 10 or 15 years that he was working in that industry. We shared very similar sensibilities, a similar love of various cinema genres. We have been working together for the last twenty years or so. Who was the first cinematographer whose work you became consciously aware of and who are a few contemporary DP’s whose work you admire? I’m not sure who the first cinematographer was that I became consciously aware of, but my heroes in terms of cinematography when I was studying cinema and developing my skills were guys like Gordon Willis (The Godfather, Annie Hall), Vilmos Zsigmond (Deliverance, The Deer Hunter), Russell Metty (Bringing Up Baby, Touch of Evil), Robert Burks (Rear Window, Vertigo) and Stanley Cortez (The Magnificent Ambersons, The Night of the Hunter). They were the people whose work I was absolutely transfixed by when I was first starting out in the business and they’re still probably the guys I would say are my greatest influences and the cinematographers whose work I still love the best. I would seek out stuff they would have shot based purely on the fact that they shot it regardless of who the director might be. In terms of contemporary cinematographers, obviously, Emmanuel Lubezki (Children of Men, Gravity) is someone whose work you can not possibly ignore. Wally Pfister (Inception, The Dark Knight trilogy), Roger Deakins (The Shawshank Redemption, No Country for Old Men) and Robert Richardson (Platoon, Inglorious Basterds) are also contemporary cinematographers whose work I really, really like. I don’t know that any of those (contemporary) people that I mentioned are people who have influenced me or my look directly, but I think that you can see probably a fair bit of influence in Patrick from guys like Gordon Willis, Stanley Cortez and Russell Metty just in terms of the embracement of darkness and the use of shadow and perhaps even to a certain extent the palette of the film. Budget is often the largest determining factor in choice of a camera for a film like Patrick, but what were some other considerations that went into choosing your camera and lens package? Obviously budget is a massive consideration in any production in terms of the equipment you’re going to use to shoot the film. Mark was adamant based on the visual influences of the film that he wanted to shoot this anamorphically. I was really keen to do so as well, but we were fairly sure we wouldn’t be able to afford to actually do that. But luckily we were able to afford to do that and the film was shot using Hawk anamorphic lenses, which are wonderful, precise, sharp anamorphic lenses, but in hindsight perhaps a little too precise and sharp. They really didn’t provide us with a lot of the sort of anamorphic aberrations and artifacting that I associated with the more traditional Panavision series anamorphic lenses. They were so flare-free and precise that I think we only got one sort of anamorphic flare in the entire film, and that was when we were actually pointing the torch of an iPhone directly down the camera. So they are wonderful lenses, but in terms of the actual anamorphic look that replicated the sort of anamorphic films that we grew up watching and loving, I think perhaps they had engineered out a little too much of the organic anamorphic look that we all know and love. The camera that we shot on was the Arri Alexa, which is my absolute go-to camera and favorite camera. Unfortunately, due to various budget and equipment house issues, we ended up having to shoot on an Alexa with a 16:9 sensor when obviously we would’ve been a lot better off with a 4:3 censored camera given we were shooting 2:1 anamorphic. But I was hoping that we would be able to shoot the film in ArriRaw and that would make up for the lack of resolution caused by using less of the censor. Ultimately it ended up that we couldn’t afford to shoot ArriRaw just because of post-production and data costs and we found ourselves in the potentially terrifying position of shooting a film for theatrical release on a 16:9 censored Alexa anamorphically going straight to ProRes, which I was incredibly worried about in preproduction. I was also unable to do any proper tests given I wasn’t actually getting the Hawk anamorphics into the country until two days before we started principal photography. I managed to test the lenses just before the shoot and did a comparison test just between the Raw and going to ProRes and was actually incredibly happy with the results going to ProRes even though we were only using two-thirds of the censor. But the inherent slight amount of grain probably produced by being ProRes rather than Raw I actually found was an advantage. To me it helped bring back a little bit of the filmic look that we were sort of losing because the Hawk lenses were just so sharp and so precise. How did you and director Mark Hartley settle on the look of Patrick, which is full of fluid camera moves, low-key lighting and a muted color palette? The camera is pretty much constantly in motion in Patrick and was obviously something that Mark and I were fairly passionate about. We wanted the film to have no handheld shots at all and it doesn’t have a single handheld shot. We wanted to approach the coverage of the film in a very traditional way. And just keeping the camera fluid, whether it was just a subtle jib up during a dialogue scene or a slow dolly in or a slow dolly out, kept things energized. It was only a 25-day shooting schedule, so often coverage was a little less than it should have been for particular scenes. But we found that by just moving the camera slightly it felt like there was a lot more happening photographically in the scene than perhaps there was and people perhaps then wouldn’t notice that a particular scene had been covered in three shots when we’d originally storyboarded it to be covered in 15 or 16 shots. In terms of equipment it was very basic, traditional filmmaking equipment to move the camera. We had a dolly for the entire shoot and the camera was constantly on the dolly. We only had a crane for I think three or four days because of budgetary restrictions. A lot of people say that there appears to be a huge amount of overhead coverage in the film. Some of this was obviously done on the days we had our crane and a remote head and we could do direct overhead stuff. But a lot of the overhead shots were cheated off dollies and risers and that sort of thing so we certainly weren’t blessed with a huge amount of fancy or expensive camera rigs and mounts to get the shots. Most of them we got in a very basic, old-school, traditional way. What were some of the films you used as reference for the look you were striving for? (Above) A split diopter shot from Patrick. Split diopters are filters that attach to the lens and allow focus in the extreme foreground and background simultaneously. Maybe it’s just the Pino Donaggio score or the use of split diopters, but there also seems to be a little bit of Brian De Palma in the film. The influence of De Palma on the film is certainly not just the Pino Donaggio score (ed. note – Donaggio scored Carrie and Dressed to Kill for De Palma). De Palma’s films were a huge influence on the look stylistically and photographically of Patrick. Mark and I both love De Palma’s work and it was one the main reasons why the film needed to be anamorphic and we wanted to embrace the use of split diopter shots. Whenever we could come up with an idea for a clever split diopter shot (we used it). Neither of us had much experience in terms of using them, but it ended up being a fairly straightforward exercise. Though we’d thought them out quite well in advance, it was remarkable how easily they worked on set. As soon as we found ourselves framed up looking at the monitor for a split diopter shot, we’d sort of turn to each other and it just suddenly felt like a real film and the kind of film that we’d grown up watching. It was exciting to use them. There’s a huge debt to De Palma’s work in the film, as well as a huge debt to Hitchcock. And obviously De Palma is a protégé (of Hitchcock), so there’s a lineage. This film needed to be, we thought, sort of a contemporary combination of Hitchcock’s work, De Palma’s work and also with a nod to Richard Franklin, who was the director of the original Patrick and also a protégé of Hitchcock’s. Right through to things like the special effects, where we wanted the effects not to look too polished or contemporary. We wanted them to have a bit of that film realism – as opposed to CGI realism – that you see in films by Hitchcock where you sort of know it’s an effect or you know it’s a matte painting, but it still looks fantastic. It just doesn’t look 100 percent real. The film’s psychiatric hospital the Roget Clinic plays such a central role in the film. Tell me a little bit about that location. Were all the interiors built on a stage? All the main locations in the film were built as sets. Patrick’s room, the ward room, pretty much all the interiors of the hospital were built as a series of quite large sets. Mark and I, well particularly me perhaps more so than Mark, I was really keen to try and shoot the film on sets as opposed to trying to go to real locations. It was something that we really needed to do if the film was going to get made. We had huge restrictions in terms of actor availability and crossover times for actors and there was no way this film could be shot even close to, not that any film is ever shot in sequence, but there was no way this film could be shot even close to in sequence. I needed to be in a position where we could build sets and I could have all the sets up in the studio for the entire duration of the shoot and I could essentially pre-light all the sets and then we could just jump from set to set, day to day depending on what actors we had available and what scenes we needed to shoot. I also was very keen to avoid the sort of Australian film thing where you basically always go onto real locations and just make of it what you can. I wanted to have much more of a controlled, studio, non-realistic film in terms of the photography and the sets. Some of the interiors of the hospital, like the foyer and the big stairwells and stuff, they were actually shot on location in the interior of what (we used as) the exterior (for Roget’s Clinic), which was just a large, rundown mansion on the outskirts of Melbourne in Australia. Below, Richards talks us through a few of Patrick’s shots. During Patrick’s opening pre-credit sequence, the camera pushes in to one of the Roget Clinic’s nurses as the house lights go out (the top image) and the nurse turns with only her cellphone providing illumination (the bottom image). I was pretty adament that (the phone) should be the single light source in that scene. Given the extreme speed of modern digital cameras, I thought that there was a good chance we would actually be able to shoot that scene purely using the screen of an iPhone. We ended up tricking up an iPhone and putting a very small LED litepanel on the phone just to lift the light levels up a little bit, but to me it seemed important the phone was the main focus in that scene. We were making a film that visually was, I thought, a little bit confusing for the audience. It was a contemporary film, relying on contemporary technology i.e. iPhones and computers and things like that, but the look of the film was very much a period film and I just thought by using the iPhone as her way of lighting up that scene and also lighting her that it immediately dragged us into knowing that the film was contemporary despite the look of the nurse’s uniform and the environment. This shot is a good illustration of your willingness to allow shadows to play on your characters’ face, whether in using a sidelight as a key or a shot like this where Vinson’s face falls completely into darkness. I always wanted the photography in the film to be adventurous. I feel like a lot of films, particularly Australian films, can suffer a bit from being over-lit and perhaps being a bit literal or obvious in the lighting. I’ve never been afraid of areas of darkness in a set. In fact, I think particularly for a film like this it makes sense that it should be as contrasty and moody as it possibly can be while still getting a commercial release. There’s three main times of day in this film – daytime, dusk and night time – and I wanted none of those to be particularly different from each other. I always wanted people to be a bit unsettled by the fact that they never really knew what time of day it was, that even when it was daytime it was still dull and dark like the exterior was completely fogged in and there was virtually no light coming through. Mark was generous enough to allow me to push the levels of darkness in this film beyond what he initially thought I might do. To me, photographically, if you’re making a film with scares in it and jump scares and the traditional kinds of things you associate with the horror genre or Gothic thriller genre, surely not being able to see everything is a lot more effective than being able to see too much. 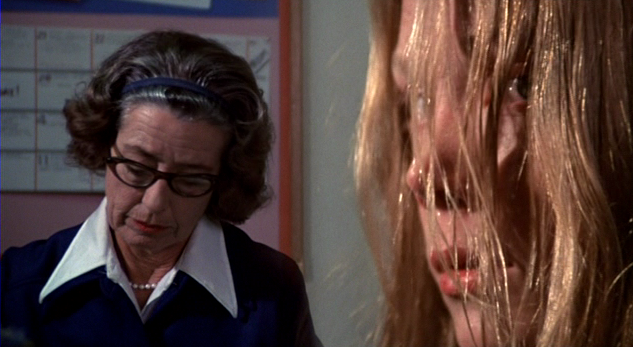 This formally composed shot ends a scene in which Vinson suffers a fright in the main patients’ ward. In the shot, the camera slowly dollies away from Vinson. You see a lot of dollies into people, but I think a dolly away from someone to end a scene is actually a really powerful piece of cinema language. Mark and I are both big fans of well-composed and graphically-composed shots as opposed to just coverage that’s based on shaky-cam handheld or that kind of energized camerawork, which obviously there is a time and a place for but this film certainly wasn’t the time or the place. We were blessed to be able to get together two or three days a week for three or four months before we started photography and just sit there and basically come up with ideas for shots that we’d always wanted to do. We’d always try to start and finish a scene with a really well-executed classic film shot and then we would sort of hope that if we’d done that people might not notice that perhaps the coverage mid-scene was a little less exciting or detailed than it probably should have been. Split diopter shots – Patrick (top), Brian De Palma’s Carrie (middle) and Alan J. Pakula’s All the President’s Men (bottom). An example of your use of split diopters. Can you walk me through the specifics of how you created the effect? All the split diopter shots in this film were shot in-camera with actual split diopters. There’s no green screen or post trickery involved in any of the diopter shots. They’re all old-school, in-camera diopter shots basically using the same pieces of glass people have used for the last 50 years to do split diopter shots. They don’t get rented out a lot these days in this country I must say, but the look you get doing a split diopter shot with split diopters as opposed to just tricking something up in post is completely different. 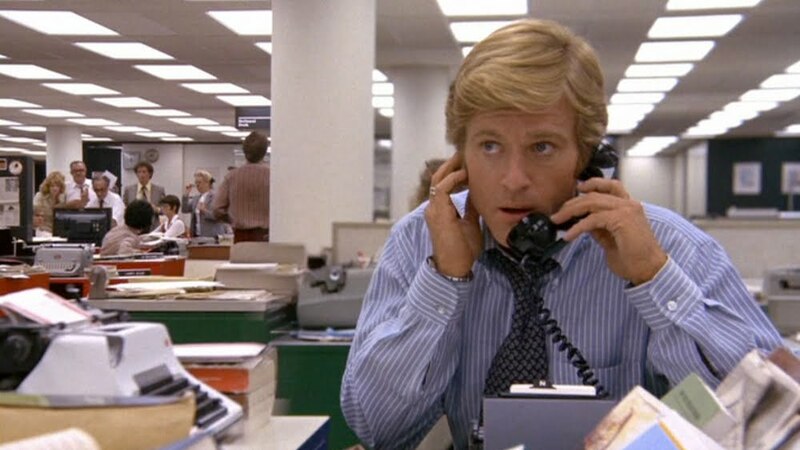 As soon as we would put the diopter on the camera it just gave it a certain look that resonated as being the real authentic split diopter that you grew up with Gordon Willis doing in All the President’s Men and De Palma using so effectively in so many of his films. They were fairly straightforward to set up. Obviously the shot has to be static and the position of the actor pretty well controlled, but if you think it through it was actually incredibly easy to hide the line of the diopter in all the shots we did. Obviously having dark backgrounds and a lot of shadow really helped. It was a lot easier to execute than we perhaps thought it was going to be. We thought that the split diopter shots could be the one thing that really slowed us down when we were shooting and that we may find that we had to drop a few of them. But we actually did every diopter shot that we were intending to do in the film and generally speaking they didn’t take any longer to do than any other shots. An extreme close-up of Vinson’s cheek in a scene in which she is about to be terrorized in her bathroom by flying shards of glass. It’s really interesting to me that you chose that shot. It’s stylistically probably a little incongruous in terms of the way the rest of the film uses lenses and it was actually a shot that I really wanted to do. Mark was, generously, happy for the shot to happen, but I don’t think he quite saw what I saw. I saw it as being a really nice abstract opportunity to create a pause in that scene and sort of just let us identify a little with the character in that moment where she – and us – are waiting for something to happen. It’s a bit of a strange shot in the context of the film, but I think it works really well in the scene in terms of creating a breath before the onslaught.